The Wally is a technique for gaining advantage of wind shifts when you can’t or shouldn’t tack (read the overview). And yes, there are times and conditions where you shouldn’t tack (see Break-even tacking). In this exercise we will use the Ockam37 polar as an example. If you would like to follow along, you can download it from here. 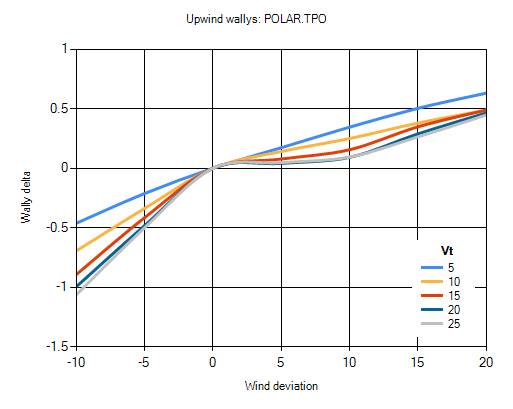 The Wally function uses the Ockam polar function VmcAngle which gives the angle of maximum Vmc at any true wind angle. Upwind and downwind targets are merely special cases of the VmcAngle at 0° and 180° true wind angle respectively. 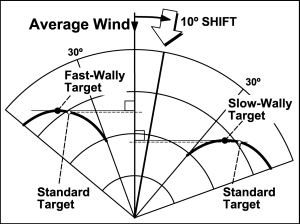 As you can see from the diagram, for a 10° shift, the fast-wally will be the max Vmc at a true wind angle 10° greater than normal, while the slow-wally is at a true wind angle 10° less than normal. Now, using the Ockam37 at 12 knots we will calculate the Wallys. VmcAngle(12 kt, 0°) is 39.3°. This is the normal upwind target angle in 12 knots. Boatspeed(12 kt, 39.3°) is 7.434 knots. This is the normal upwind target speed in 12 knots. Vmg is 7.434*Cos(39.3°) or 5.752 knots. Find the fast-wally (at +10° VmcAngle). VmcAngle(12 kt, +10°) is 31.1°. True wind angle is base angle + VmcAngle, or 41.1°. Boatspeed(12 kt, 41.1°) is 7.603 knots. Fast-wally is therefore (7.603 – 7.434) or +0.169 knots. If you weren’t wallying, your Vmg up the average wind would be 7.434*Cos(29.3°) or 6.483 knots. By walling, your Vmg up the average wind is 7.603*Cos(31.1°) or 6.510 knots; +0.027 knots. That doesn’t sound like much, but you are also lateral separation pumping. Find the slow-wally (at -10° VmcAngle). VmcAngle(12 kt, -10°) is 39.6°. True wind angle is base angle + VmcAngle, or 29.6°. Boatspeed(12 kt, 29.6°) is 6.525 knots. Slow-wally is therefore (6.525 – 7.434) or -0.909 knots. If you weren’t wallying, your Vmg up the average wind would be 7.434*Cos(49.6°) or 4.818 knots. By walling, your Vmg up the average wind is 6.525*Cos(39.6°) or 5.028 knots; +0.210 knots (+4.3% or 35 seconds/mile). Yes. Slow-wally is very effective. For some boats, going a knot slow is a challenge. But, if you can handle it, you will be gaining a lot. And the Lateral Separation pumping at -9.7° true wind angle difference will be quite rewarding. Otherwise pinch as much as you can get away with. The complete Wally graph for the Ockam37 looks like this.